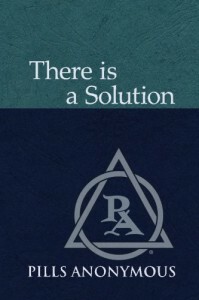 You may now purchase the fellowship’s book, “There is a Solution”, directly from PA in quantities of two or more. We do not charge tax or shipping on these orders, and all proceeds from all sales go to Pills Anonymous World Service. Click on the link below to send an email to us with: Your email address if different from where you are contacting us from and the number of books you would like to purchase. We will send you an invoice and ship upon payment. Please click here to email us to order books! There is a Solution is available through Amazon. This does not constitute an endorsement of Amazon, and we will have more choices for purchasing the book in the near future.